No matter what subgenre they're classified as, Born of Osiris is consistent in their creation of assaultive, intricate metal, and The Discovery is no exception. Born of Osiris was one of the first bands to break away from the deathcore craze in favor of technically-infused death metal. The Illinois-based band had an edge over most of their contemporaries in this endeavor, though. As one of the only deathcore bands at the time to use keyboards, Born of Osiris easily transitioned out of their deathcore roots after their 2007 EP, The New Reign. Just in time for their first full-length album, 2009's A Higher Place, the group reconstructed their sound on their own terms and made a huge impact, landing at number 73 on the Billboard 200 charts in its first week. This established Born of Osiris as a heavyweight group in the world of metal and also paved the way for their second album. The Discovery is a solid record with a number of unexpected twists and turns during its nearly-53 minute run-time. Like many of their peers, Born of Osiris has maintained some of its deathcore tendencies, even after the genre adjustment. However, in the midst of the breakdowns and guttural vocals, there are also plenty of surprising melodic and progressive inclusions to balance things out. The soloing by guitarists Lee McKinney and Jason Richardson is of particular significance, showing plenty of guitar prowess and finesse throughout the album. Keyboardist Joe Buras also makes his presence felt more on this album than on anything else Born of Osiris has ever released. Whether it's the electronica-inspired outro on "Devastate", the bell chimes on "Two Worlds of Design", or the backing symphonics on "Shaping the Masterpiece", keyboards are more than just another part of the rhythm section on The Discovery. The clean-sung interlude "A Solution" is perhaps the biggest shock on the album, as Born of Osiris has never shown any inclination for clean singing on previous albums. 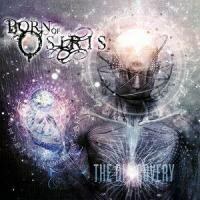 Of course, some critics have criticized Born of Osiris as mere trend-jumpers within the metal world. Those voices may amplify upon receiving The Discovery, as it clearly is influenced by the rapidly-growing "djent" subgenre. The muted riffing style inspired by Meshuggah and made popular by bands like Periphery and TesseracT has become a trend in the same way that deathcore skyrocketed in popularity five years ago, so it's easy to claim that Born of Osiris is simply changing styles to match the new fad. However, this is an inaccurate criticism since Born of Osiris has employed downtuned palm-muted riffs since the band's inception. This aspect of their style is just coming to the forefront more heavily on The Discovery. What makes The Discovery special is its expansion of the band's sound, which it does very well. Born of Osiris used to be just a deathcore band, but in the course of four years, they have become infinitely more than that. Showing a more complete grasp of their compositional range, this group will now be able to reach a very widespread audience and make them regular listeners. This album will have no trouble attracting fans of metal bands ranging from Periphery to Winds of Plague and everything in-between.